The Hero of Winds in His Classic Green Outfit, Back Again! From the popular game - The Legend of Zelda: Skyward Sword™ - comes a rerelease of figma Link™! Using the smooth yet poseable joints of figma, you can act out a variety of different scenes. A flexible plastic is used for important areas, allowing proportions to be kept without compromising posability. 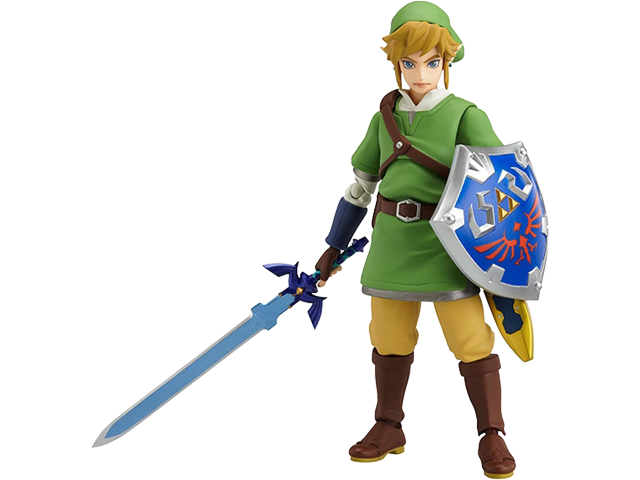 He comes with his standard gallant expression, as well as a powerful shouting face for combat poses.The Master Sword as well as the Hylian Shield are both included. They can also be carried on his back as they did in the game. A poseable figma stand is included, which allows various poses to be taken.